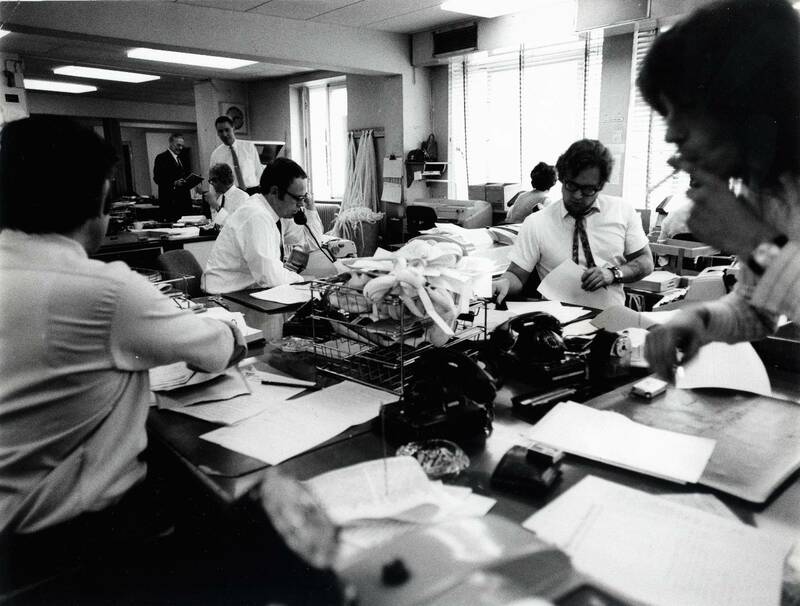 The photographs shown here depict the Central News Room in full operation. Some of the pictures were taken in moments of crisis like the Arab-Israeli War of June 1967, thus they convey at least an idea of the atmosphere in the CN during the 1968 invasion of Czechoslovakia. 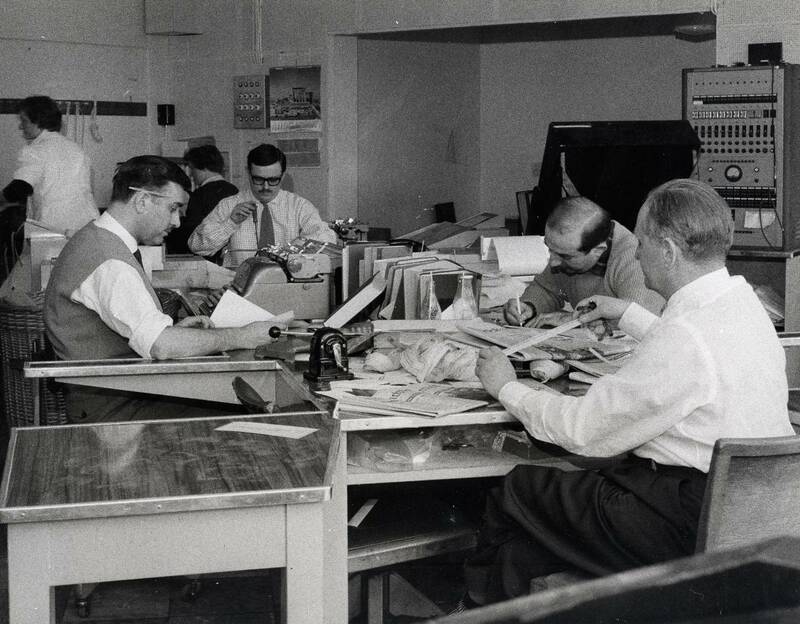 CN news editors were experienced, professional journalists hailing from Commonwealth countries and the U.S. (as opposed to broadcast desk staff, who were for the most part émigrés – with a variety of backgrounds – from Eastern Europe). CN staff was almost exclusively male and white. 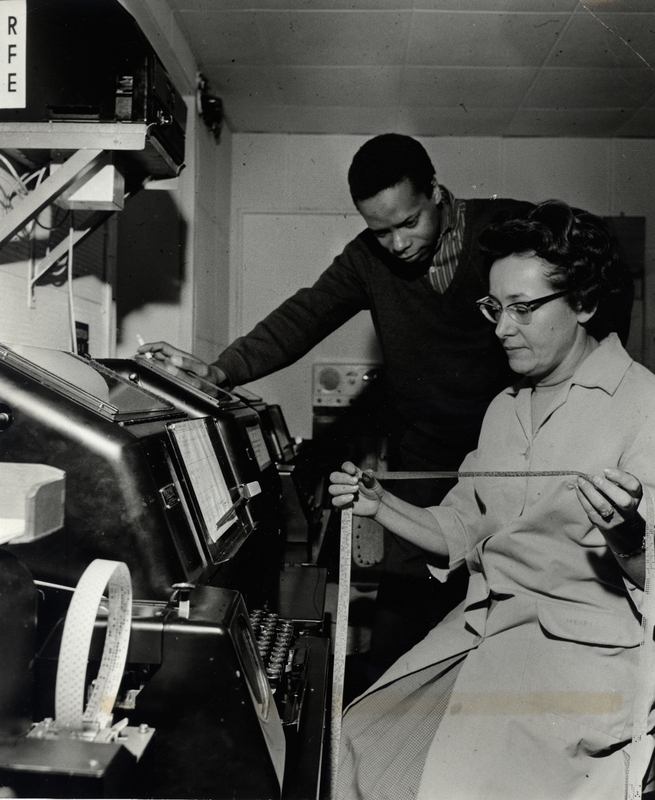 Women were rarely hired, and if so, they were employed to handle technical equipment rather than working as news editors. 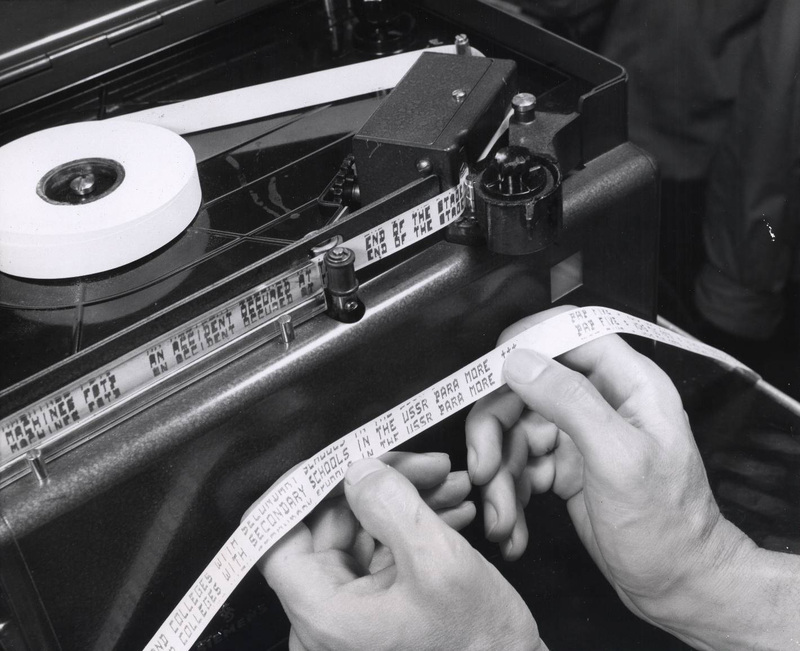 The variety and quantity of equipment in the CN is amazing: there are telephones, typewriters, radios, television sets, numerous teletype machines and even a Hellschreiber machine — a device used to intercept communications between various European press agencies, especially those behind the Iron Curtain. 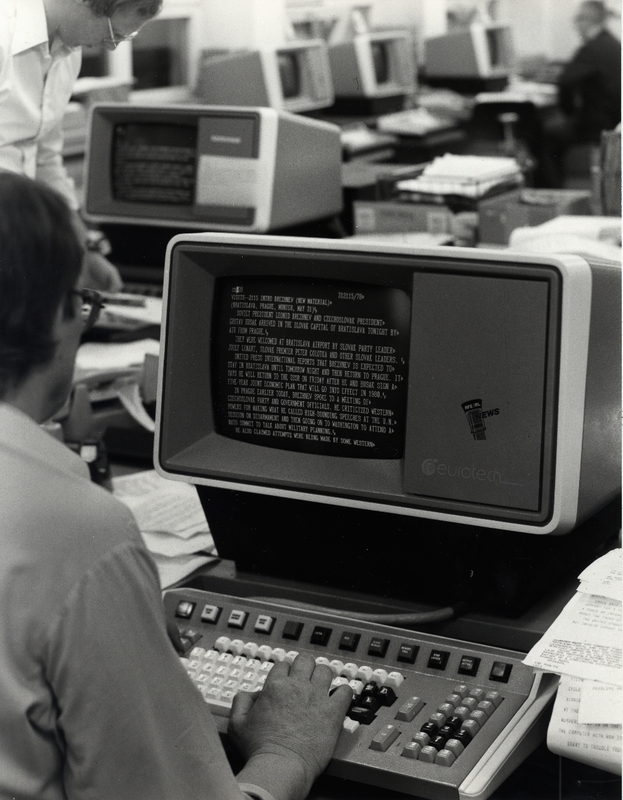 The photographs also convey a sense of the movements and sounds of the busy, noisy Central News Room, ticking at the rapid pace of typewriters and teletype machines. 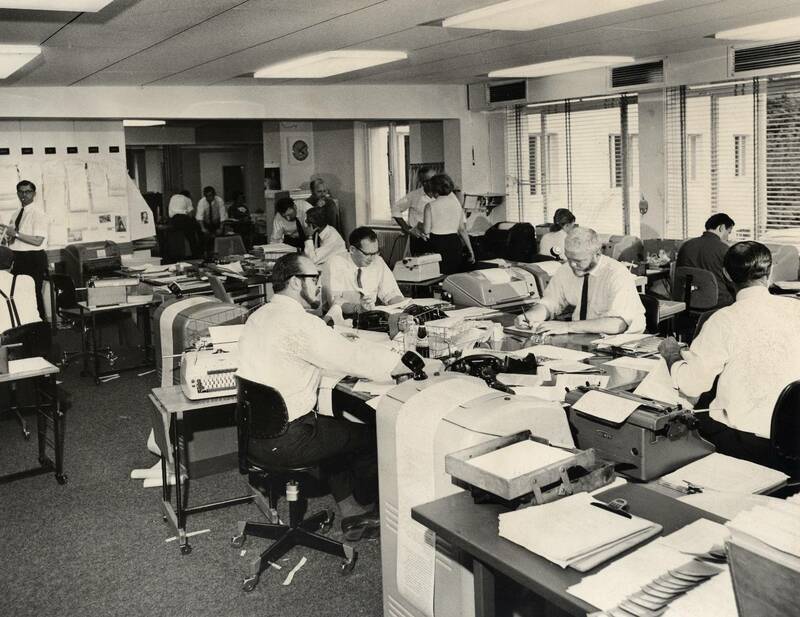 The Central News Room was manned 24/7: a number of photographs shot at night (with artificial lighting, blinds closed, and windows darkened) attest to the fact that the CN was a continuous, permanent operation. 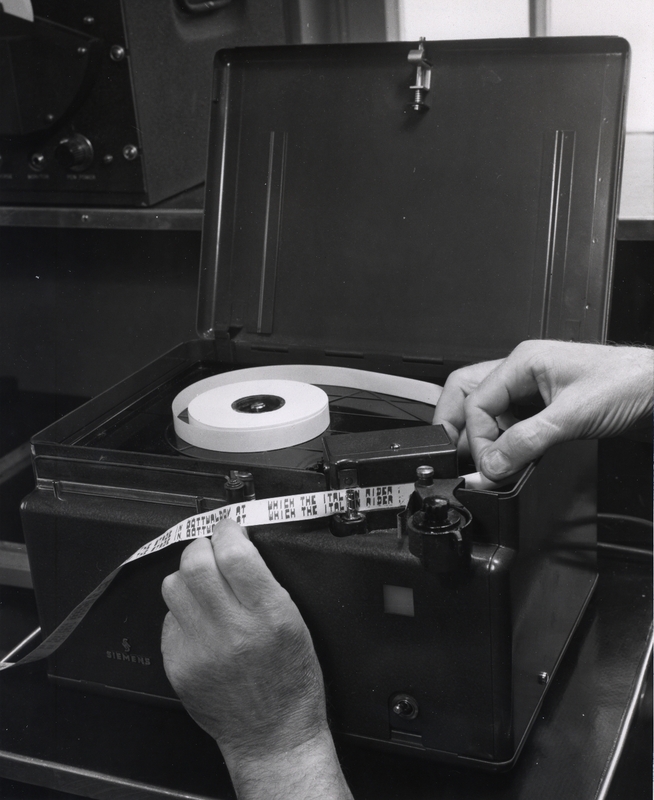 Ownership of and copyrights to the photographs belong to RFE/RL, Inc., 1201 Connecticut Ave., N.W., Washington, DC 20036, USA. Permission to use the photographs for purposes other than research and education shall be requested from RFE/RL, zvanersm@rferl.org. 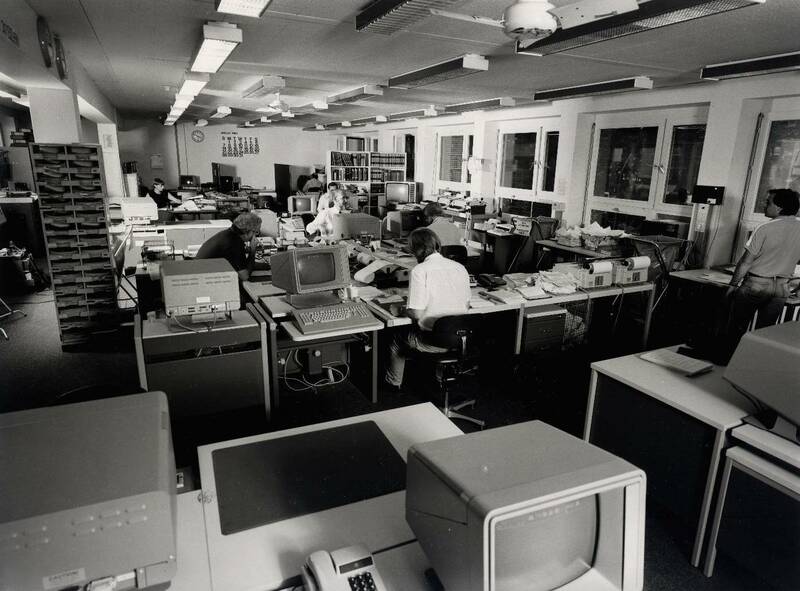 MUNICH -- An overall view of the Central News Room at Radio Free Europe/Radio Liberty. Central News is an internal news agency serving as clients the news desks of the 21 different language services within the radio. 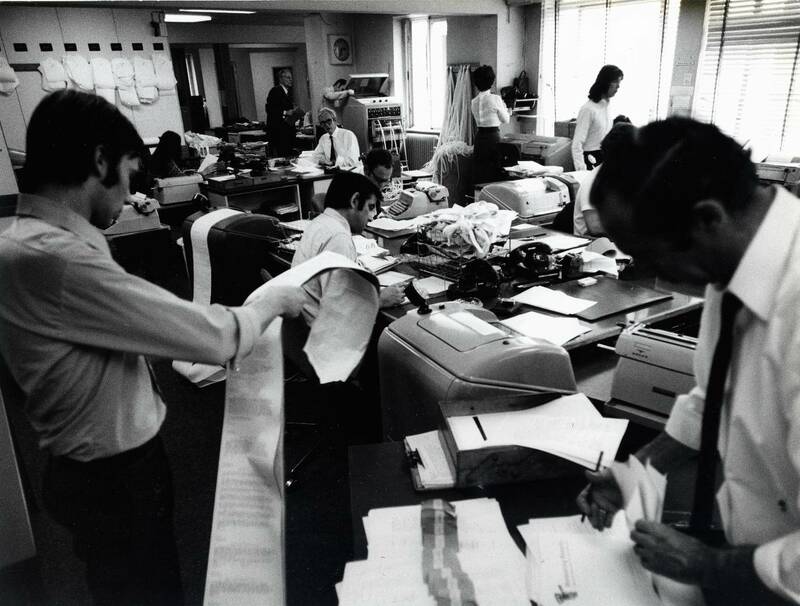 The news room takes in more than a million-and-a-half words every 24 hours from Western and Eastern news agencies, its own bureaus in major capitals of the world, Eastern radio and television. Editors boil this huge flow down into a running file of just over 100,000 words daily that move out to the 21 news desks on two in-house wires around the clock. 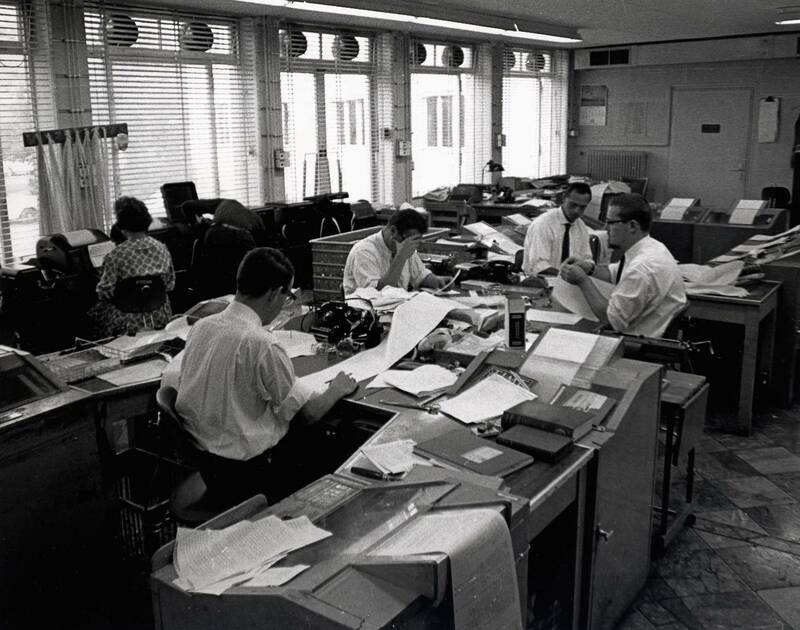 RFE covers the Middle East Crisis -- In the Central News Room of Radio Free Europe Headquarters in Munich, Germany, members of the RFE News Department prepare up-to-the-minute dispatches on the Arab-Israeli war for listeners in East Europe. 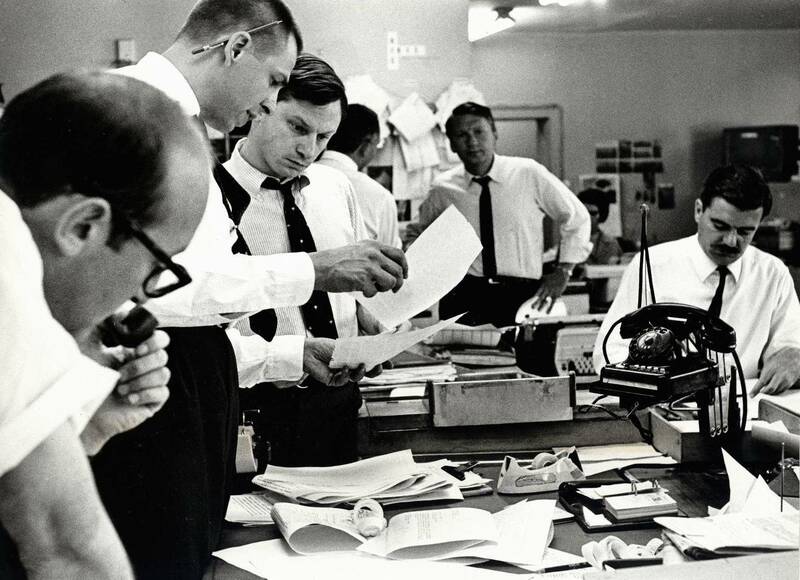 Pictured from left are Deputy Director Tom Bodin, Editor William Kirtz, News Director Nat Kingsley, Special Events Chief Stephen Steinberg and Editor Jon Powis. June 1967. 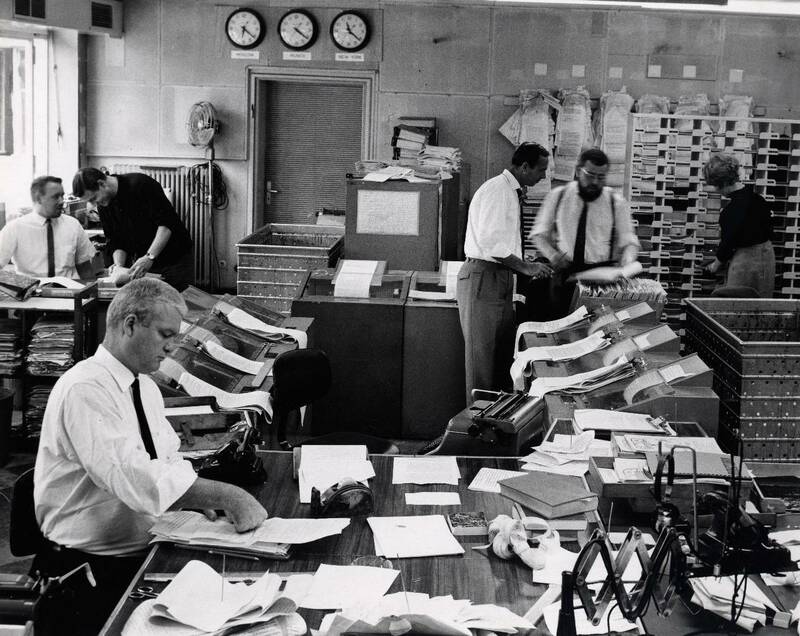 News Room at Radio Free Europe's Munich, Germany headquarters receives dispatches from all over the world. 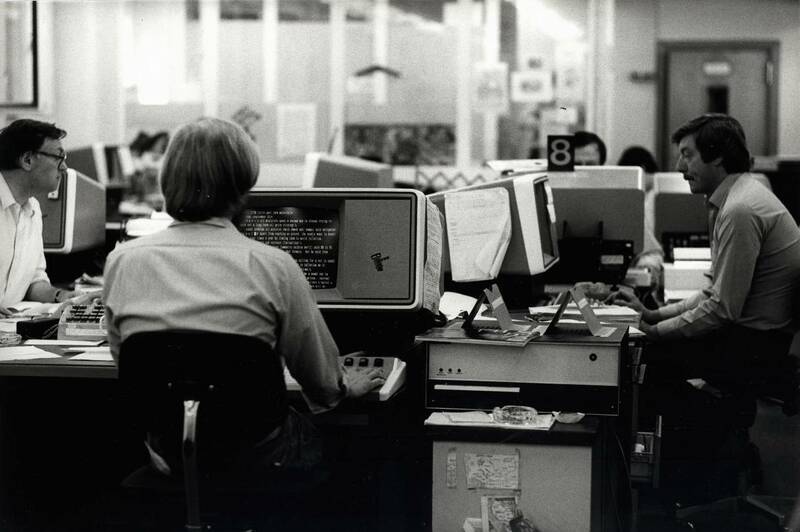 News and programs of news analysis make up roughly 50% of RFE's daily broadcasts to the Communist-dominated people of East Europe. MUNICH -- The Central News Department at Radio Free Europe/Radio Liberty is an internal news agency serving as clients the news desks of the 21 different language services within the Radio. 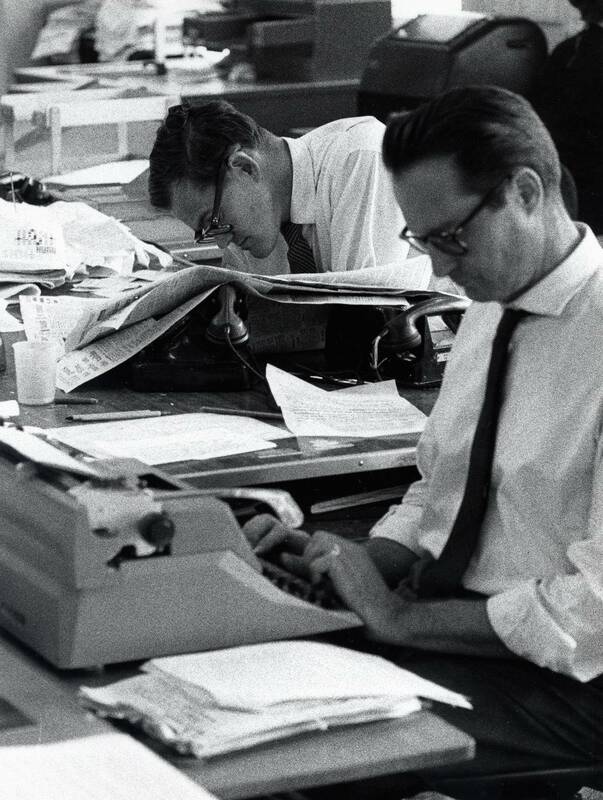 The Central News Room takes in more than 1,500,000 words every 24 hours from Western and Eastern news agencies, its own bureaus in major capitals of the world, Eastern radio and television. Editors boil this down into a running file of just over 100,000 words daily that move out to the 21 news desks on internal A and B wires around the clock. 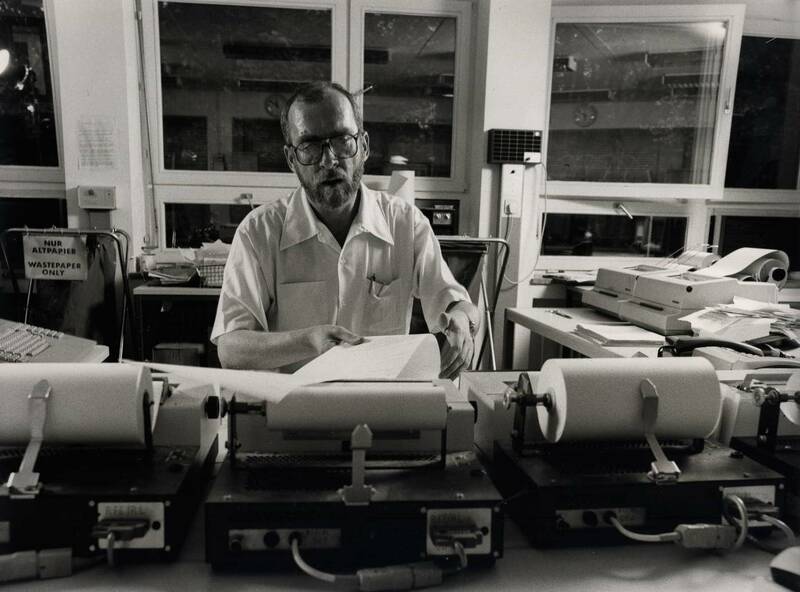 Here editor Charles E. Barr studies incoming copy from East European news agencies. 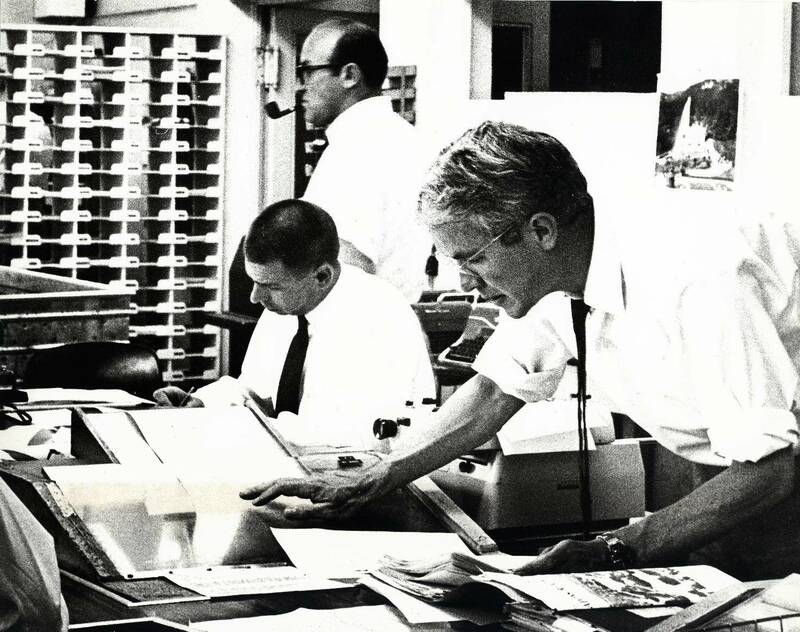 Gene Mater, director of news, reads an incoming bulletin on early developments in Dallas, following President Kennedy's assassination. November 22, 1963. 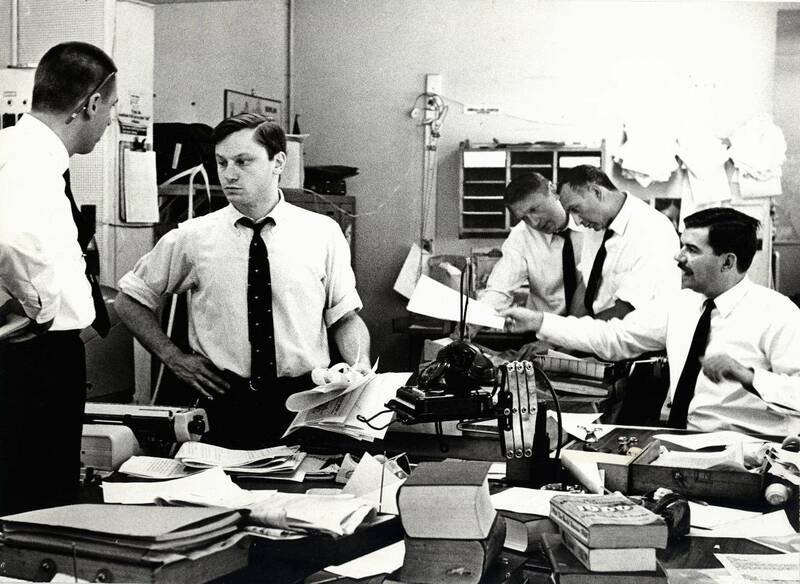 RFE COVERS THE MIDDLE EASET CRISIS -- At work in RFE's Central News Room during the Arab-Israeli war: (from left) Editor Arthur Breslauer, Assistant NEws Director Tom Bodin and Deputy CNR Chief Brian McGill. June 1967. RFE COVERS THE MIDDLE EAST CRISIS -- In the Central News Room of Radio Free Europe headquarters in Munich, Germany, RFE editors examine latest dispatches on the Arab-Israeli war. 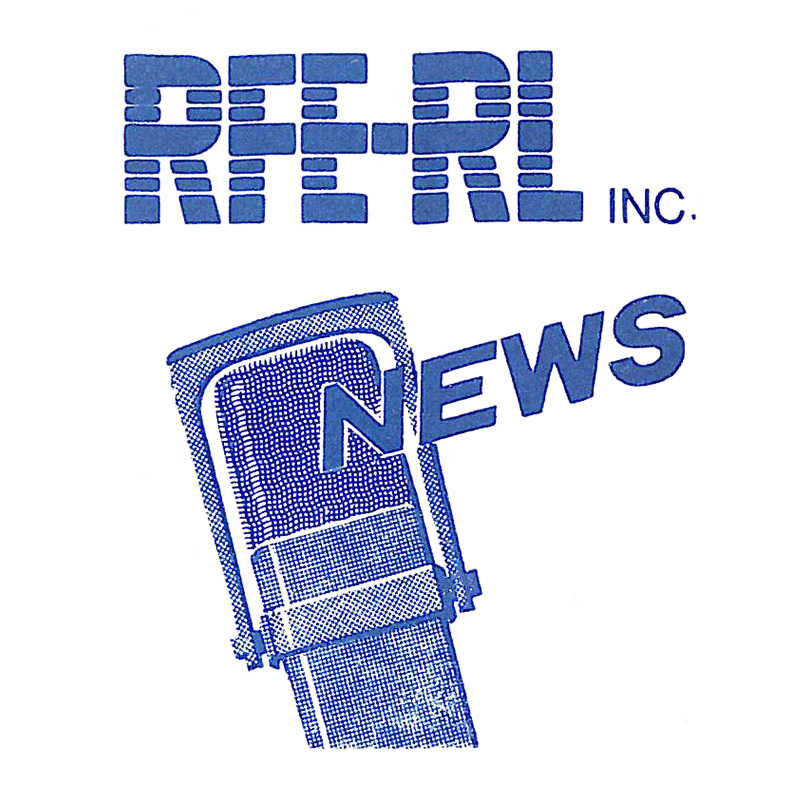 RFE kept its 22 listeners in East Europe informed with up-to-the-minute bulletins on developments in the conflict. June 1967. MUNICH -- The Central News Department at Radio Free Europe/Radio Liberty is an internal news agency serving as clients the news desks of the 21 different language services within the Radio. 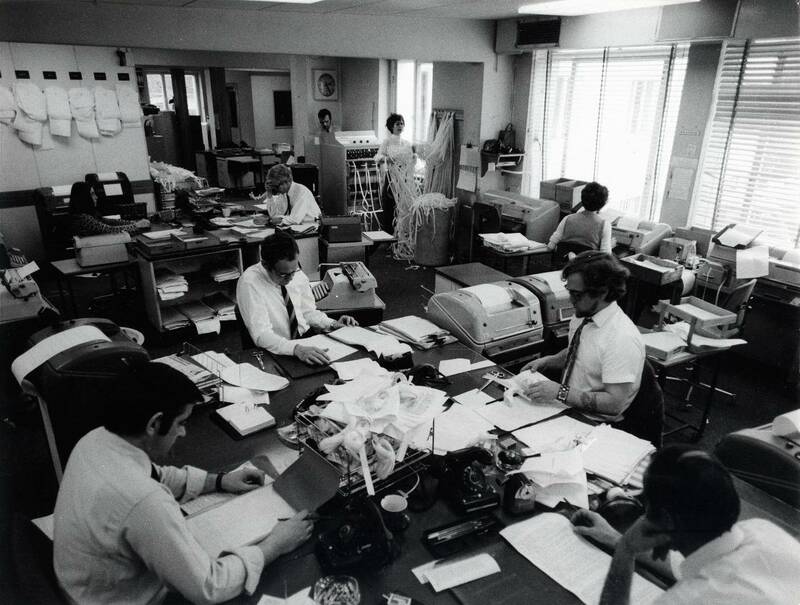 The Central News Room takes in more than a million-and-a-half words every 24 hours from Western and Eastern news agencies, its own bureaus in major capitals of the world, Eastern radio and television. Editors boil this down into a running file of just over 100,000 words daily that moving out to the 21 news desks on in-house A and B wires around the clock. 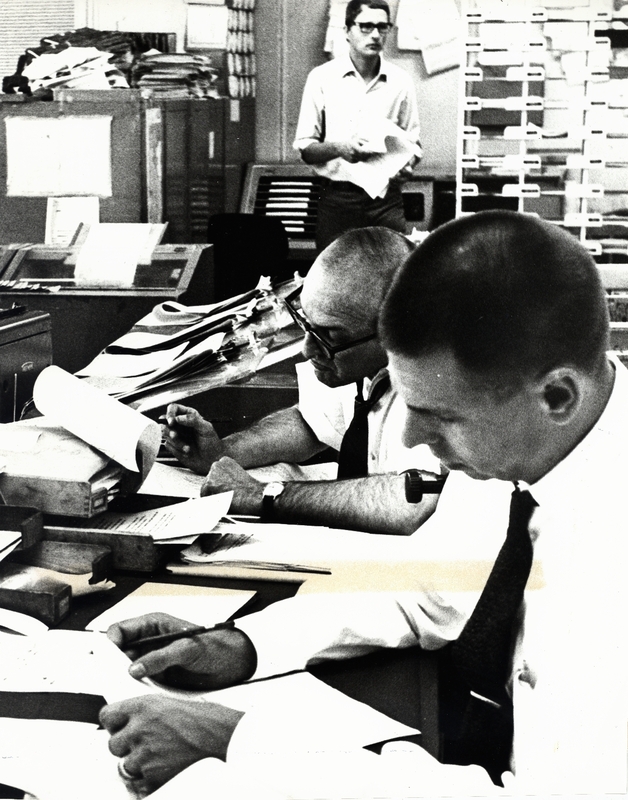 Here Deputy Director Barry Griffiths studies incoming news agency copy. MUNICH -- The Central News Department at Radio Free Europe/Radio Liberty is an internal news agency serving as clients the news desks of the 21 different language services within the Radio. 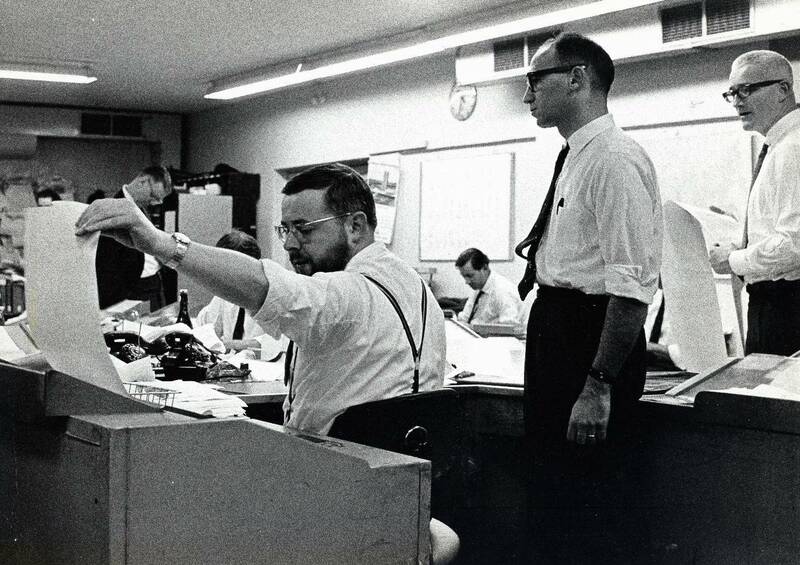 The Central News Room takes in more than 1,500,000 words every 24 hours from Western and Eastern news agencies, its own bureaus in major capitals of the world, Eastern radio and television. Editors boil this down into a running file of just over 100,000 words daily that move out to the 21 news desks on in-house A and B wires around the clock. 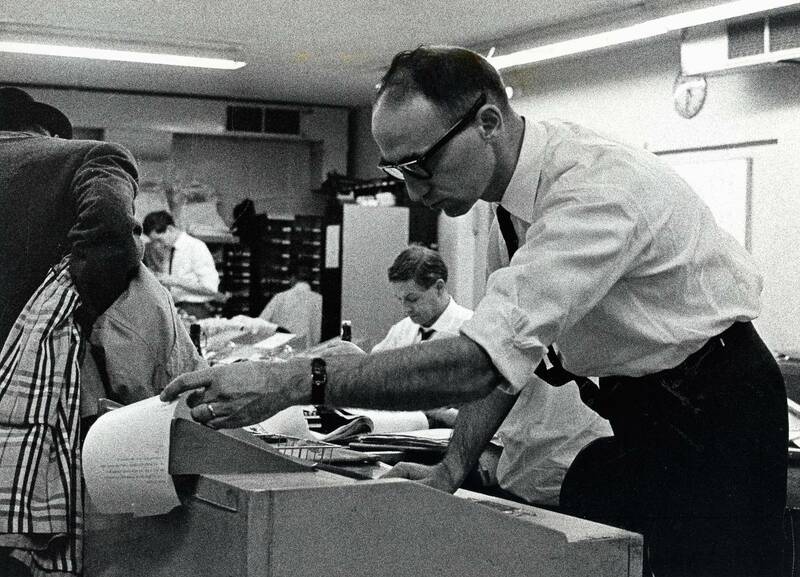 Here slotman William de Armond looks over incoming copy from Western news agencies before distributing it for editing and rewriting to news room editors. 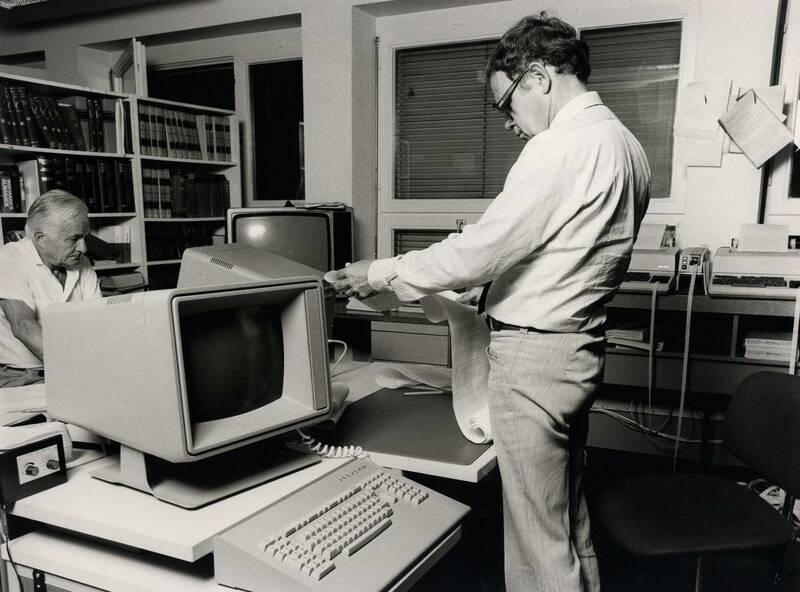 MUNICH, West Germany -- More than one million words daily flow into this modern Central News Room at Radio Free Europe/Radio Liberty, where multi-lingual editors refine them into an internal outflow to language service newsrooms of about 100,000 words daily. News sources include most major Western news agencies, the Radio's own bureaus in Western capitals, and Eastern press agencies and radio and television. 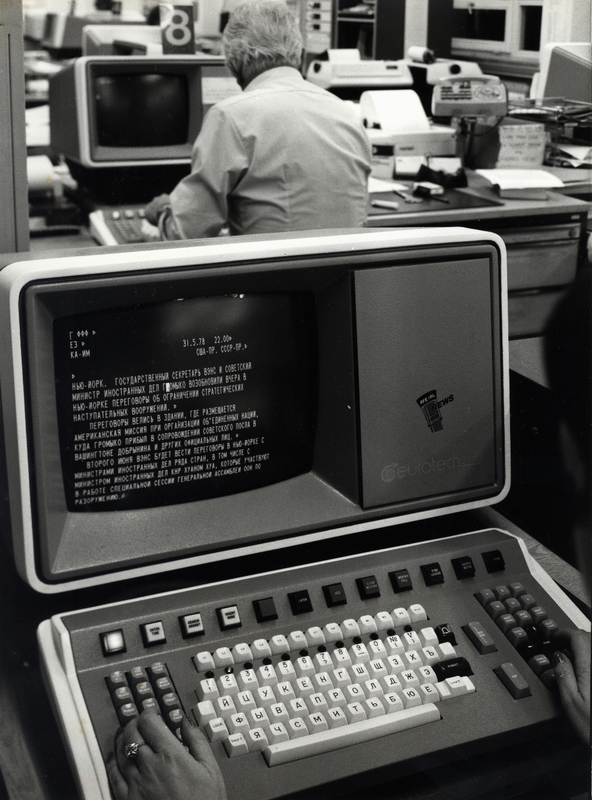 The computerized Visual Display Terminal systems simplify editing, eliminate telex tape-punching and speed the 24-hour daily flow of news to the 21 language service newsrooms. MUNICH -- The RFE/RL Central News Department functions 24 hours a day, 365 days a year, with modern, computerized visual display terminals, permitting the processing of more than one million words of incoming news copy each day from the world's major news agencies and RFE/RL news bureaus in Western capitals. 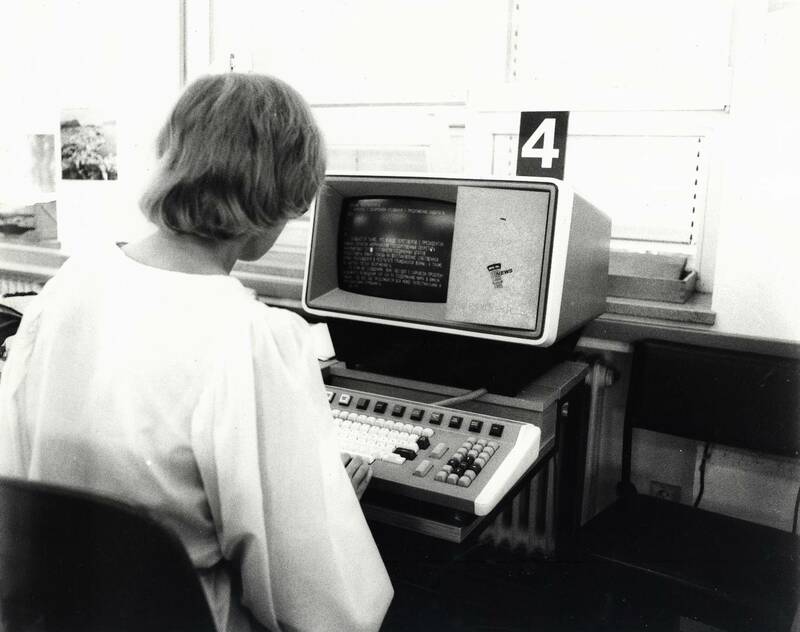 MUNICH -- The RFE/RL Central News Department receives and moves its copy via modern, computerized visual display terminals in five different languages, including Russian. 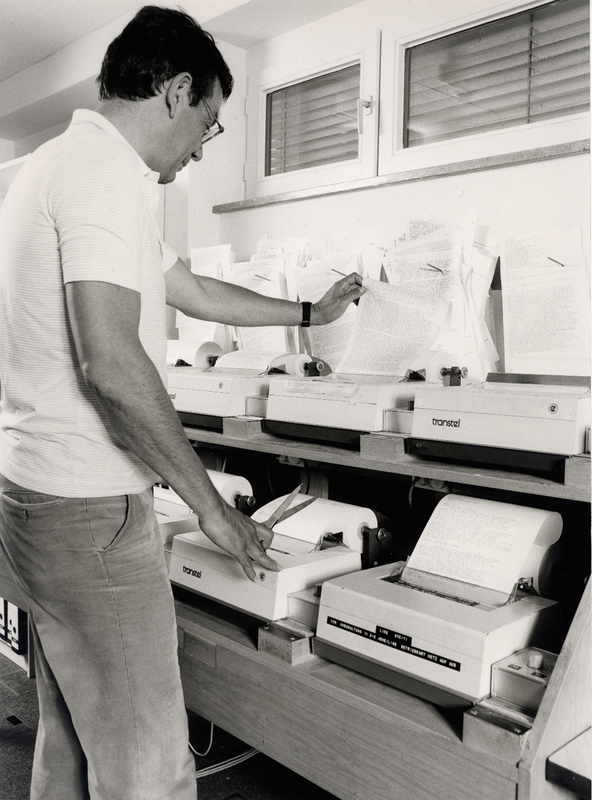 Eurotech, the manufacturer of the display terminals, designed these machines especially for RFE/RL to permit punching and display in the Cyrillic alphabet. The Radio Liberty Division moves all of its 24-hour-a-day news file in Russian to its Russian and 15 nationality language services. RFE Division services receive their news file in the Latin alphabet, using English, German, French and Italian. 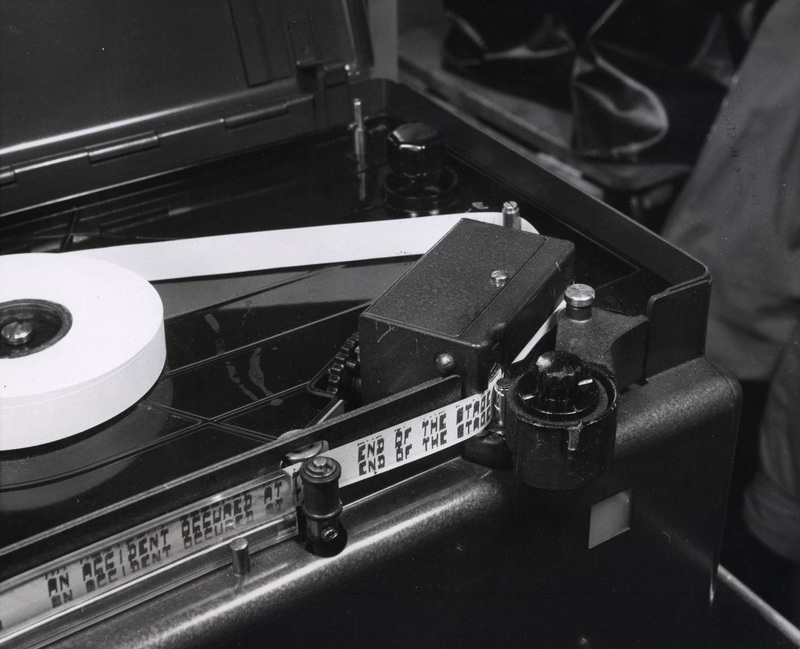 Helleschreiber machine - This instrument intercepts communications between various European press agencies, especially those behind the Iron Curtain. In this way, RFE receives news transmitted between the captive countries before their own editors do.